SNES Super Star Wars: Return of the Jedi (USA v1.0) in 23:17.12 by arandomgameTASer. 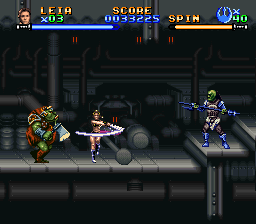 Super Star Wars: Return of the Jedi is the third game in the Super Star Wars series, a series notable for its run-and-gun gameplay. In this run, arandomgameTASer deals with intense lag reduction, along with many glitches and tricks, to finish the game in a fraction of the time it would take normally. Clearly, the Force is with him. In addition to this run, there are also runs of the first and second games in the series: Super Star Wars and Super Star Wars: The Empire Strikes Back. Note: A section of the final level has its audio muted on YouTube to prevent copyright claim and removal of the entire audio track.